Photograph depicts two infantry soldiers from the Canadian Expeditionary Force (Siberia) posing for a photograph at Willows Camp, Victoria, B.C. 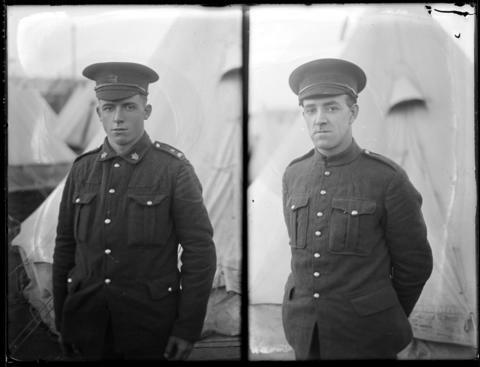 The soldiers in the first picture wears the 5-button British pattern uniform that was popular near the end of the war. The second soldier wears the original Model 1903 Canadian 7-button jacket. Restriction: image J-01883 is a glass plate negative. Researchers should consult the online reference image prior to consulting the original.